I love, love, love prosciutto so this special ingredient was very welcome. From Wikipedia…Prosciutto is a dry-cured ham that is usually thinly sliced and served uncooked; this style is called prosciutto crudo in Italian and is distinguished from cooked ham, prosciutto cotto. I bought “prosciutto piccolo” which, according to eHow, translates from Italian means “little prosciutto” or “little ham.” The only difference between prosciutto and prosciutto piccolo is prosciutto is cured with bone while prosciutto piccolo is not. Even though the procedures are the same for curing ham in Italy, each region has its own specific standards. Prosciutto piccolo is a traditional Italian meat that is delicious when wrapped around fresh fruits and vegetables or served in a sandwich. 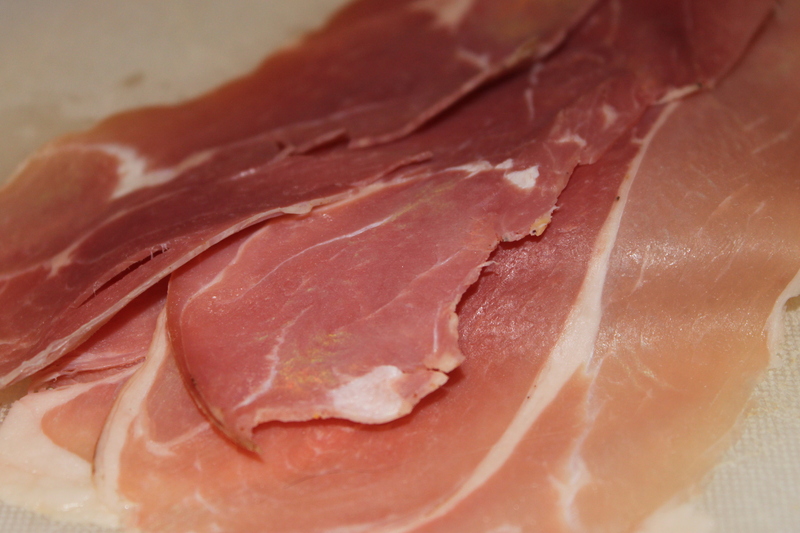 Cooking with prosciutto? Here are some great recipes! Prosciutto di Parma is the best. PFI carries it. You can also sometimes get a prosciutto fat cap from them for free when you buy their Prosciutto di Parma. That’s great for rendering down and using as you would bacon fat. Think of it as a base for soups, sauces, or even sauteing vegetables. I recently had a beef prosciutto, also called Bresaola, which is really good. Got that from Ballard Market. Salumi’s has a lamb prosciutto which is quite extraordinary. Just some ideas if you two want to try using different types.